I dropped in to the National Memorial Arboretum in Staffordshire a couple of weeks ago and was delighted to see how the memorial sculptures that I have installed there over the last 4 years or so have settled in. The memorial for the Bevin Boy miners that I worked on in 2012/13 was the first piece that I have made for the National centre of remembrance. 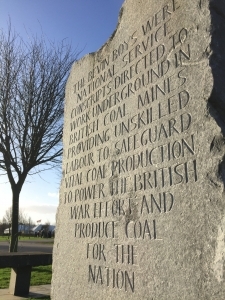 The memorial consists of 3 pieces of Kilkenny limestone that tell the story of the Bevin Boys contribution towards the 2nd World War effort. The pieces were unveiled by HRH The Countess of Wessex in 2013. 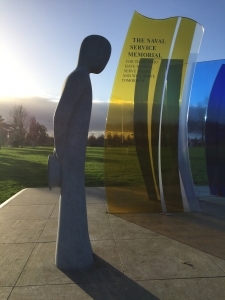 In 2014 I installed the Naval Service Memorial. This piece was commissioned by the Royal Naval Association and is a combination of coloured glass and stone. 13 giant glass sails cast coloured shadows across a white granite terrace. At midday, the outline of a warship is formed by the coloured shadows while a Kilkenny Limestone Sailor, head bowed, watches on. What has been wonderful to observe with this piece is how it changes through the course of a year. Visit the piece in the summer and witness strong, intense colours in the shadows, in the Autumn and Spring, the warship is at its best, while in the winter, the low sun causes the blue watery shadows stretch across the length of the terrace, inviting the viewer to wade through them. This piece was short listed for the Marsh Award for excellence in public art. I also visited the Scout Memorial which was unveiled in June. 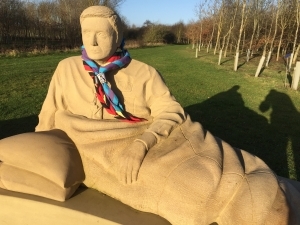 The memorial recreates a camp fire scenario, with carved sandstone scouts resting in their sleeping bags.They are watched over by a Scout leader as they sit around a kinetic camp fire designed by Angela Conner. Every time I have visited this piece, Scout groups have adorned the leader with a new necker. You can never be certain how a sculpture will be received by the public, you can never be certain of your own reaction to it either when you move it from your workshop to its final location. I am delighted that all of these pieces as well as the Guinea Pig Club Memorial unveiled in November, have had a terrific reception from visitors and National Memorial Arboretum staff.